They've done World War 2, the Cold War, and even the moon, so the only setting left for COD's Zombies mode is, er, the 1940s again. But this time with a film noir theme. CODBLOPS 3's Zombies mode has been revealed in a new trailer, and it looks like some campy noir fun. "Shadows of Evil introduces four unwitting characters who must uncover the secrets and challenges laid out for them by a shadowy figure, who offers them a path to redemption. 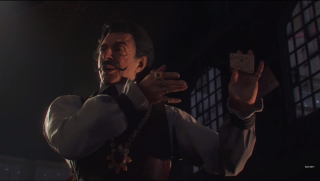 Jeff Goldblum, Heather Graham, Neal McDonough, and Ron Perlman star in “Shadows of Evil,” a new survival co-op experience only available in Call of Duty: Black Ops 3. Unravel the secrets and explore a massive 1940s, film noir-inspired world in the deepest Zombies experience to date." Black Ops 3 is out November 16, and you'll be able to jump straight to the final campaign mission, if you like.